These instructions are written for those who have a basic knowledge of in-Design CS6 and PDFs. The following instructions were written during July, August and September of 2012... very grueling and exhausting months. These instructions are from those months of trial and error searching for work-arounds to my software and computer setup to allow me to create my first eMagazine/eBook... to sell at Amazon's Kindle Store, using only PDFs. I hope they will help clear up any problems that you may come across during your quest to create your first eMagazine/eBook. I started my journey because I wanted to convert my well-established print-on-demand magazine, “In Frame Visual Arts” magazine a publication on art, fashion, photography, film, TV and stage, to a digital format for mobile devices. I wanted to avoid recreating a second version of the magazine from scratch. My magazine is full of graphics and photographs so it would have been extremely time consuming to start from the very beginning. I figured that I could use a short cut by creating the magazine's ePub project file (ePubs are required to then be converted into a Mobi file which is then uploaded to Kindle Store) with PDFs from my original project file of the magazine. Sounded simple enough at the time. I thought finding instruction on how to create an ePub or a Mobi, from my already designed magazine, would be a piece of cake. Well, I was in for a big surprise. I could not find any instructions on my original plan of attack. So I ended up spending those three months teaching myself how to create an ePub using only PDFs. This learning experience just reinforced my belief that digital technology still has a long way to go to create more compatible apps and devices. However, I'm sure the computer savvy people may enjoy the challenges of finding work-arounds for my such problem, but I'm just not one of them. I don't enjoy solving the problems such as these, I just want it to work! But I soon realized that I had to put my nose to the grindstone with this scenario if I wanted to create my eMagazine/eBook. These instructions are on how to convert a magazine designed in inDesign CS6 for print, to an ePub (format for Barnes and Noble eBooks) and then on to a Mobi (format for Amazon's Kindle eBooks). I created my eMagazine/eBook with inDesign CS6, on a Mac OS X 10.8.2 using Mountain Lion operating system. I will focus on creating the format for uploading an eMagzine/eBook created only with PDFs to Amazon's Kindle Direct Publishing for self-publishers. 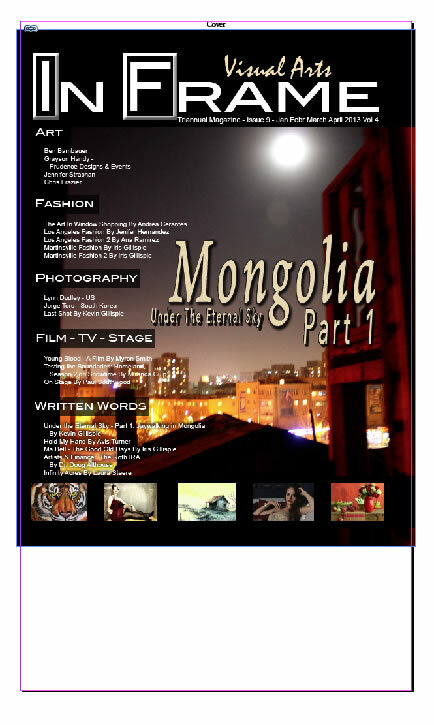 To learn more about my magazine and it's formats you can view it at my website: www.inframevisualarts.com. Within inDesign, I had trouble creating my eMagazine/eBook in the “book” layout. For some reason the Kindle previewer would not see it... it is possible that I just did not know how to make the proper settings. I had no trouble creating it as a “single” document. So I have written these instructions for working with “single” documents. 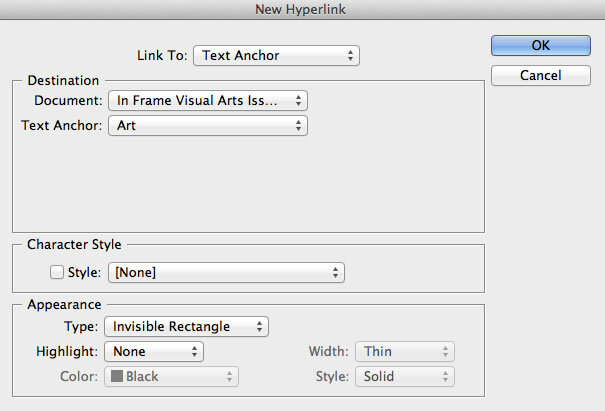 At the time of this writing the Kindle Plugin Beta for inDesign CS 6 does not work if you are using Mac OX X 10.8.2. An updated version has not been written for this operating system yet. Here I will describe how to get around this glitch. Even though I did not care about having chapters in my magazine's ePub file, I had to create them to get the ePub to work properly. Apparently this is the only way Amazon's Kindle operates. It needs to see “Chapter Titles”, for it's “Table of Contents” (TOC), to function. 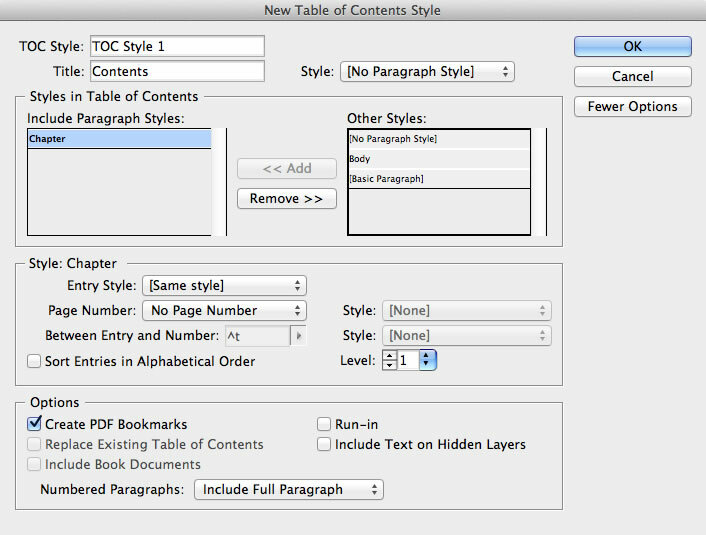 The TOC is key to your epub/mobi file working properly. Cover page (created as a .jpg). Table of Contents (created manually by you). 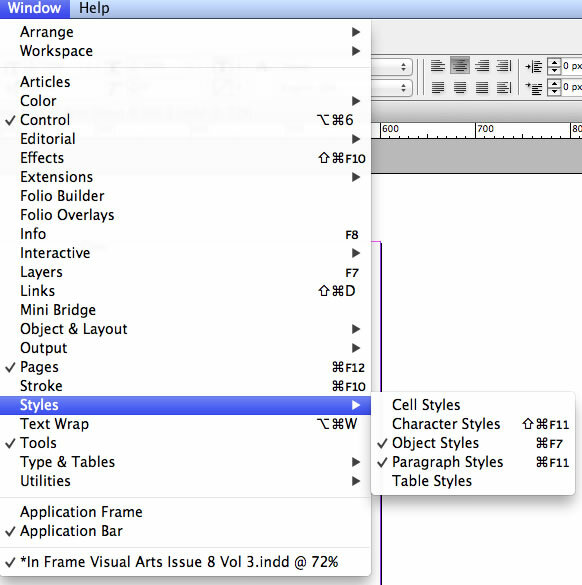 Internal or Automatic Table of Contents (created by inDesign). Chapter Pages with Chapter Titles. Pages with PDFs only. FYI - You may also be able to create an entire eMagazine/eBook using only .jpgs, instead of PDFs, I have not tried that yet. How to create an ePub using only PDFs. How to convert an ePub to a Mobi. Section 1: How to create an ePub using only PDFs. I created my magazine layout in inDesign CS 6, then convent it into a PDF for the high-gloss print-on-demand copy. I then duplicated that PDF file. That copy becomes the working copy for the ePub format. 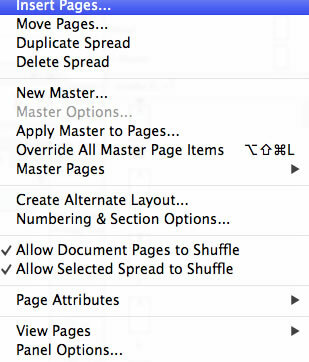 Next, split the duplicate PDF file into individual pages with Adobe Acrobat Pro. Click on their Tools button → Split Document. Save those single pages, in a separate file in your ePub project folder. You will have to do this for all pages. A short cut to do all at once, is to go to the Pages panel, click on your first page, scroll down to your last page and hold down your shift key as you click on your last page. That selects all the pages. While they are highlighted go back to the tiny box (top right – see above) and select Override All Master Items. This should unlock the layers on all your pages. Now you're ready to add content quickly to each page. The third page will be left blank. This is where you can place the automatic TOC, which will be created later on. Page 4 – Your first “Chapter” Page. You are ready to add your PDFs. Select the page with your curser. The insertion point should start flashing at the top center of the page. Type in the name of your chapter. I chose “Beginning”. 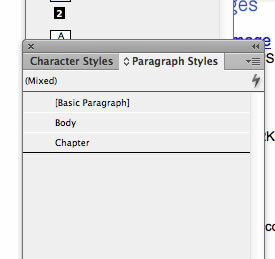 Then select the word and go to your “Paragraph Styles” panel and click on “Chapter” style (which you created earlier) to assign the info for the chapter title and click ok. Then make sure your cursor is at the end of the word. This is where you will place the PDF, go to File → Place, find your PDF and place it on the page. Once the PDF is in place... click it to make sure the little “Anchor Icon” is visible at the top of the page. If it is not, then it's not anchored... so delete the image and start over. Go back and “Place” your image again. The insertion point should be selected and flashing, that means the imported image/PDF will be anchored. Remember anchoring is very important. 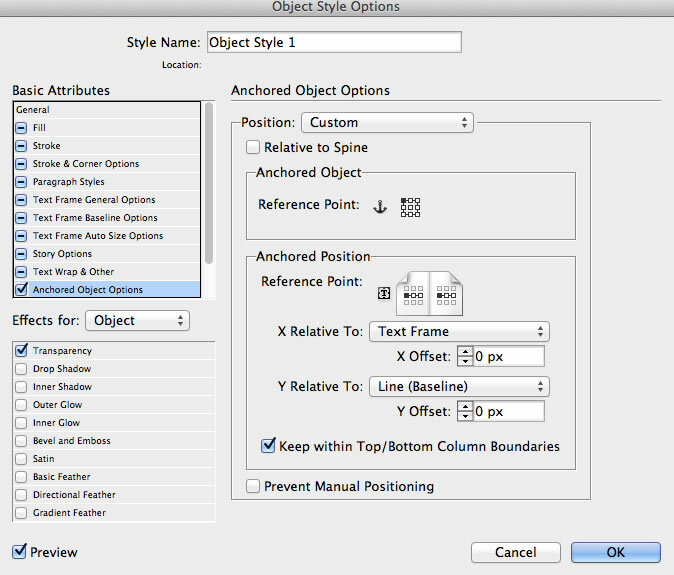 Once that is done... make sure the PDF is still selected and go to your “Objects Styles” panel and click on “Object Style 1” style that you created earlier. That assigns the proper info to the image/PDF. Make sure that you are choosing the object and not the layer behind it, which is the text frame layer. Leave that layer alone. If you accidentally select and assign it a wrong style, just go to your “Object Style” panel (or other panels that you may have clicked accidentally) and make sure the “None” is selected for the text frame layer. Don't forget to save your work as you go along. This is the process for all your “Chapter” pages within your book/magazine. Page 5 and Succeeding Pages (non-chapter pages). These pages do not need text. You will just add 1 PDF per page. Select the page and make sure your curser is flashing at the top of the page to insure that it will be anchored, then go to File → Place and choose your first page PDF. 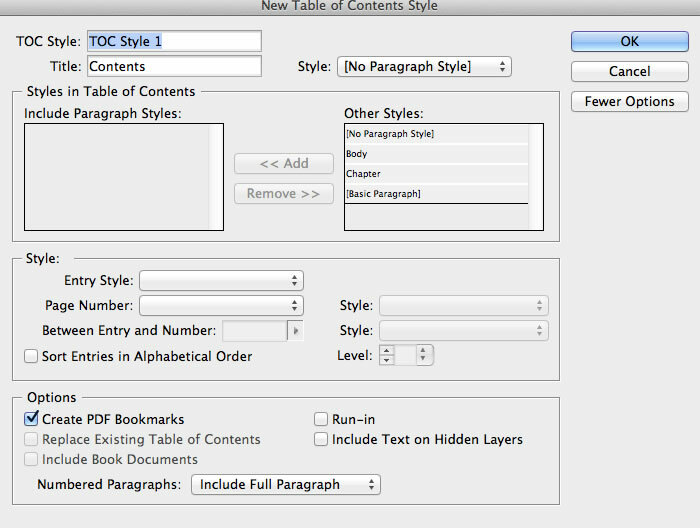 Make sure the import PDF is still selected and then go to your “Objects Styles” panel and select “Object Style 1” to assign the proper info to the PDF, making sure the bottom “Text Layer” (or layer behind the PDF) is not assigned the wrong style info. The text layer should have a “None” style chosen for it, if nothing at all. This is the process for all your non-chapter pages in your publication. 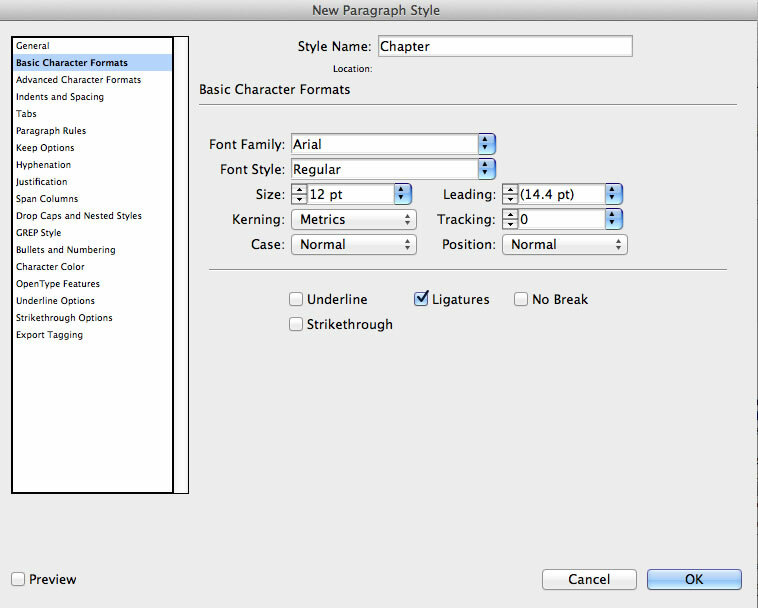 *Remember each “Chapter” name has to have a “Paragraph Style” assigned to it and an “Anchored Text”. *Each PDF or object has to have an “Object Style” assigned to it. *Each text layer should not have an assignment or make sure it is marked “none”. Now for safety sake, add one blank page at the very end of your publication. I have run into problems with different 3rd party apps that for some reason will rearrange your pages. For example one app would put my TOC page at the end of my magazine, along with a few other weird glitches. You may or may not have that problem... just to be safe put a blank page at the end. But with luck you may not need it. Then go to page 3... your blank page that you created. This is were you will put the automatically generated TOC. To do that, click on the page to select it, making sure the insertion point is flashing. 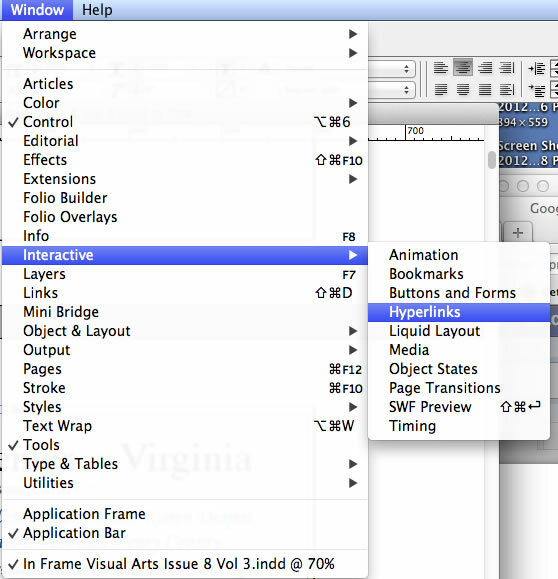 Then go back to the “Layout” drop down menu and select “Table of Contents”, notice the different ones. Once you select that, you will then see that your cursor gets loaded with a small text box. Click on your flashing insertion point. Your TOC will be loaded on to that page. Save your work... and you're done. By using the internal TOC and updating it often by going to “Layout” and selecting “Update TOC”... this will keep let you know of all the Chapter Titles are linked properly. Now for the hard part.... getting your publication converted to the proper format that Amazon's Kindle will read. 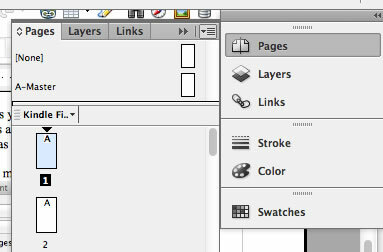 As I mentioned above, at the time of this writing, the Kindle Plugin Beta version for inDesign CS 6 does not work, if you are using Mac OX X 10.8.2. However, there is a work-around, involving several steps to creating the final format needed for the Amazon's Kindle. After the conversion... Adobe Digital Editions app should automatically open to show you how your ePub will work for on the Kindle. Test all your links to make sure they operate properly. Now you're ready to convert your ePub to a Mobi. Amazon's Kindle Publishing only takes publications in a “Mobi” format. For my computer setup that I have talked above, one has 2 options for creating the “Mobi” file.... either with an app called “Cabri” or with the “Kindle” apps. The Kindle apps can be a little daunting. I prefer using Calibre. To get the Kindle apps, go here: https://kdp.amazon.com/self-publishing/help?topicId=A3IWA2TQYMZ5J6 Be sure and read all the appropriate links for installing these apps. Note: The instructions, that come with this app, for the VeriSign Class 3 Code Signing app can be ignored because as I mentioned, it does not help the Kindle Plugin (Beta) to work with Mac OS X 10.8.2 and inDesign CS 6. With earlier versions... you should have no problems. The purpose of the Stripper app is to strip the excess files that are bundled to a “Mobi” file. An unstripped “Mobi” file will be too large to upload to Amazon Kindle Publishing. The files have to be removed/stripped. Using the Kindle apps start by opening up 2 Finder windows on your computer. Go to Applications (where you should have installed the Kindle downloads) and select “ KindleGen”. On the other window go to your ePub file that you create. Position the 2 windows so you can access both easily. Now search the word “Terminal”. It is found under Applications → Utilities. Open Terminal. Then drag and drop your “KindleGen” into the Terminal window. Be sure and hit enter to start the process. That will place the instructions needed to tell your computer to convert your file to a “Mobi” file. You also have to drag and drop your ePub file into the Terminal, below the instructions. Hit enter to start that process. If the conversion s successful the Kindle previewer window will open automatically. Or you can click on the icon and go to your file and open it that way. Note: make sure you fill out the “File Info” (found under “File”), for your document, with your publisher name, etc. And also in the exporting window of your document. This seems to prevent the “permission denied” error message in the Terminal window on converting the ePub to the Mobi. Open Calibre and select “Add Books” from the top left red icon. You will notice your file imported into the main window. 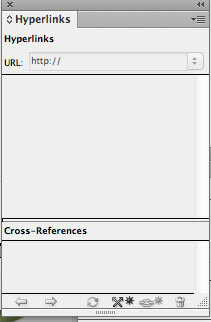 Select your file and click on “Edit Metadata”. File in the appropriate info at the top. Choose “Remove” cover. This prevents problems later on when uploading to Kindle Publishing. I don't know why this is, I've just found it works so far for me. Fill in the rest of the info pertaining to your publication and click ok. Then click on “Convert Books”. Make sure that ePub is selected under “Input Format” at the top left of window. And at the top right of window at “Output Format” choose “Mobi”. Check your other book info to make sure it is correct and click ok. The conversion process begins. This will take some time. You can then select you project and then select “View Books”. This viewer does not necessarily show your project accurately. Sometimes the viewer takes pages out of place... why I don't know. It's frustrating. Just more glitches to overlook I guess. Next select “Save to Disk” and create a new folder on your desktop. FYI – I originally created my on an external drive and Calibre did not like the long path and file names. Calibre will place 3 files in that file folder. Your ePub file, the Mobi file and the Mobi's OPF file. The OPF are files of instructions that are not needed when you upload to Kindle Publishing. The OPFs are huge and would not upload anyway. 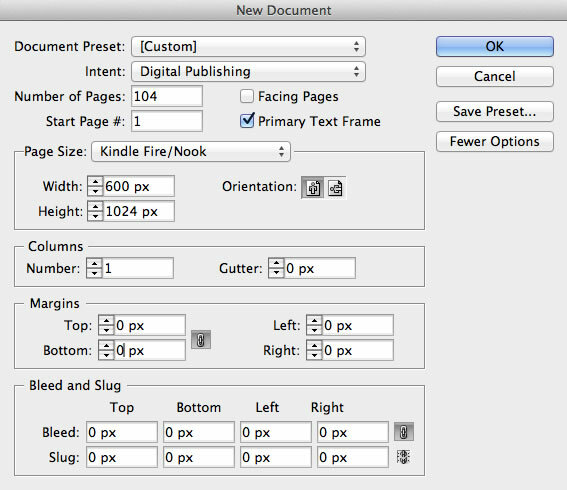 Calibre strips these excess file from the ePub making it small enough to meet Kindle's KDP size requirements of 50MBs. Next download the “Kindle Previewer” from Amazon's Kindle Direct Publishing (KDP). Open it and choose “Open Book” to preview your newly created “Mobi” file from where Calibre saved it with the 2 other files ( OPF and your ePub). This viewer is more accurate than the Calibre viewer. If all is correct you are ready to upload your Mobi to KPD. If your Mobi is not operating properly in the Kindler Previewer you will have to go back and double check for errors within the ePub project file and start your process over again. If you created a Mobi for Amazon all you have to do is import your Mobi file back through Calibre and export it as an ePub. This should make your file small enough to upload to Nook Press (Pubit). This file size maximum is 20 MBs, which is smaller than KDP. 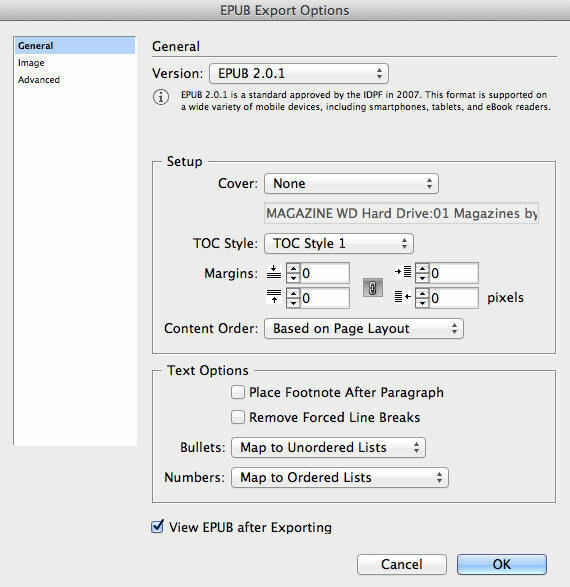 If you using an ePub creation, you may have to reduce your PDF file sizes down before importing them into your ePub project file in inDesign first before exporting it out as an ePub. Once you've done that then you just import it into Calibre and export it as an ePub again... Calibre strips all the excess files from the import file. This is a bit of trail and error to get your file size down to meet Nook Press (Pubit) requirements. I am not a computer programer or software designer, but hope I have provided some info here to help speed up your publishing journey. And maybe in a short while the computer world will have simplified the publishing process for self-publishers.